Yesterday Sacramento County Sheriff Scott Jones issued a challenge to Congressman Ami Bera to a debate on foreign policy. The challenge came after heightened concerns about terrorist attacks folowing last weekend's mass shooting in Orlando. 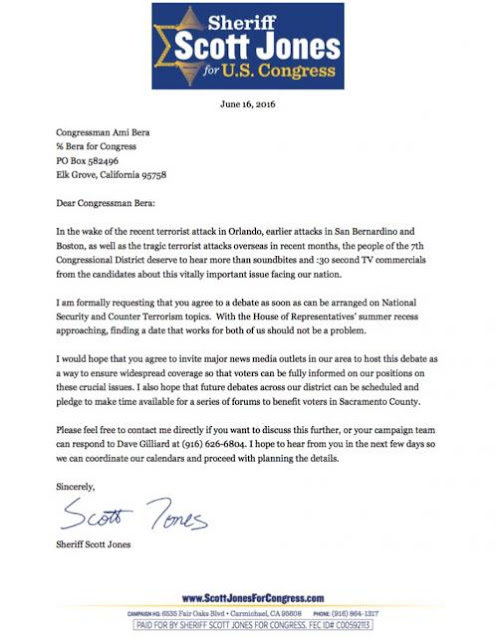 In his press release, Jones included the letter he sent (see above, click to enlarge) to Bera, the second term Democratic legislator representing California's Seventh Congressional District. Noting that forthcoming Congressional recess, Jones wrote "finding a date that works for both of should not be a problem." Republican Jones has made terrorism and accompanying illegal and refuge immigration concerns a centerpiece of his campaign to unseat Bera in the November general election. Prior to entering the race, Jones produced a widely viewed video (see below) urging President Obama to spearhead immigration reform following the 2014 shooting deaths of a Sacramento County and Placer County Deputy Sheriffs by an undocumented immigrant. In addition to the one regarding foreign policy, Jones' letter also urged Bera to participate in a series of debates throughout the district. Bera's campaign manager Jerid Kurtz did not respond to email request to comment on Jones' challenge.